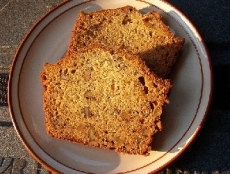 Have you made Aunt's Famous Banana Bread? 1. Cream together shortening and sugar. 2. Add eggs and mix well. Mash in bananas. Combine flour, baking soda and salt (cut back or eliminate salt if using salted butter instead of shortening) and mix into wet ingredients. 3. Stir in walnuts. Bake in a well-greased loaf pan at 350 degrees Fahrenheit for 60-70 minutes or until top is very brown and any cracks in the top are fairly dry inside. This recipe contains potential food allergens and will effect people with Wheat, Egg, Tree Nuts, Banana, Gluten, Walnuts, Natural Sweeteners allergies.